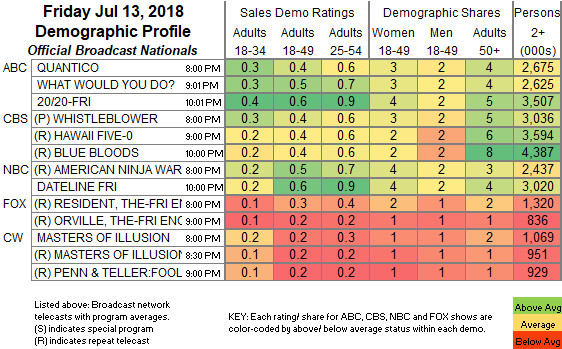 NETWORK FINALS: The AMERICAN NINJA WARRIOR rerun lost 0.1 in final numbers. 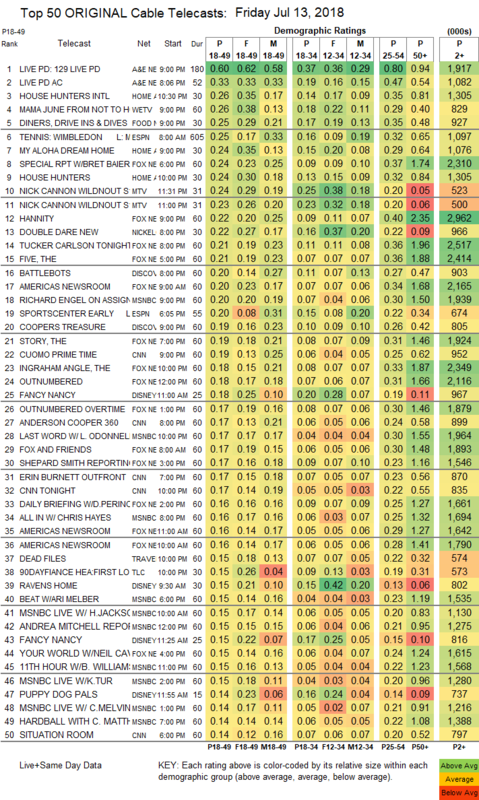 CABLE HIGHLIGHTS: A&E’s LIVE PD led Friday cable, returning from a week off at 0.60, with the preceding clip show up 0.09 to 0.33. On HGTV, HOUSE HUNTERS INTL ticked up to 0.26, MY ALOHA DREAM HOUSE was also up a tick to 0.24, and HOUSE HUNTERS was down 0.04 to 0.24. On We, MAMA JUNE: FROM NOT TO HOT gained 0.03 to 0.26, and BRIDEZILLAS was down 0.05 to 0.10. Food Network’s DINERS, DRIVE-INS & DIVES ticked up to 0.25. ESPN’s morning WIMBLEDON coverage was at 0.25. MTV’s WILD N OUT was at 0.24/0.23. Comedy Central’s BRUCE WILLIS ROAST was at 0.22. Nickelodeon’s DOUBLE DARE reached the Top 15 at 0.22. On Discovery, BATTLEBOTS rose 0.04 to 0.20, and COOPER’S TREASURE was up 0.03 to 0.19. Paramount’s BELLATOR LIVE was at 0.12. The final episode of Cinemax’s CB STRIKE rose 0.02 to 0.03/136K.